St. Paul Roman Catholic Church, located at 121 E. 117th St., in East Harlem was one of several properties deemed a landmark by the city. 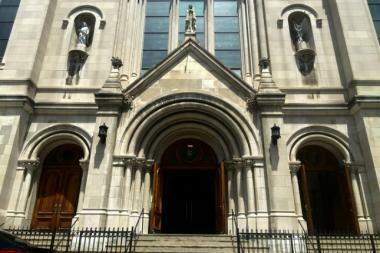 HARLEM – A pair of historic Harlem churches have become landmarks. St. Joseph of the Holy Family Roman Catholic Church and St. Paul Roman Catholic Church were protected by the city’s Landmarks Preservation Commission, which also unanimously voted to designate six other properties landmarks. “Today we designated eight great properties… reflecting the rich and diverse historic architecture of our city,” said Commission Chair Meenakshi Srinivasan on June 28. St. Joseph of the Holy Family Roman Catholic Church is at 405 W. 125th St. at Morningside Avenue. It was founded in 1860 and claims to be “the oldest existing church in Harlem and above 44th Street in Manhattan,” according to its website. St. Paul Roman Catholic Church, at 121 E. 117th St., was built in 1908 in East Harlem. It claims to be one of the city’s “pioneer churches” — one of the first six to be built in the city. The church was founded in 1834, though its original building has since been replaced, according to its website. Other landmarked properties designated include several in Staten Island and lower Manhattan.